On the final night of the 2018 ELCA Youth Gathering, a hush fell over the crowded stadium. Thousands of ELCA youth were tap-tap-tapping at their smartphones. They weren’t checking Snapchat. Instead they were texting a message to someone who needed encouragement. After completing the assignment, youth were instructed to turn on their phone flashlight and hold it high. One by one, tiny beacons of light dotted the stands, illuminating the room in a dazzling display of the Spirit at work. The moment demonstrated how the Gathering impacts participants—and everyone in their networks. 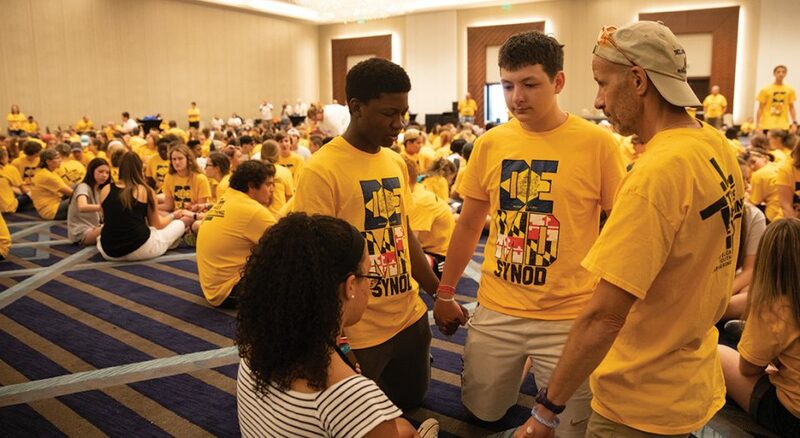 “Jesus has the power to change the world, working through us,” said Caroline Salopek, 16, who attended the June 27-July 1 event in Houston with her congregation, Holy Trinity Lutheran, Laurel, Md. 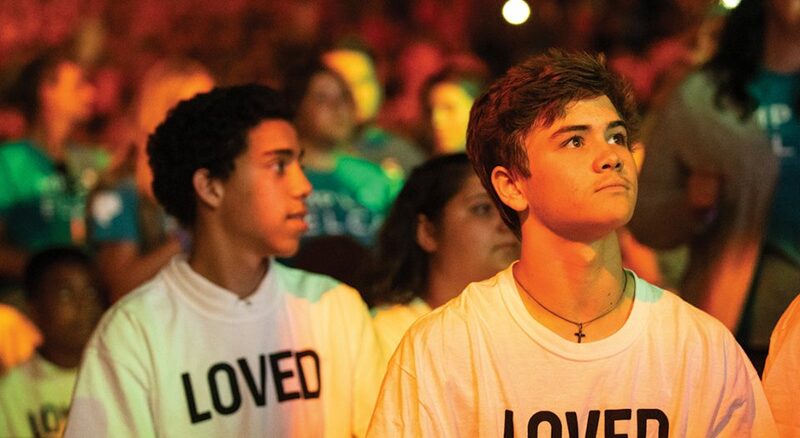 For members of this youth group, the Gathering’s central theme, “This changes everything” (Ephesians 2:8), was revealed in Scripture, stories, song and relationships. Living Lutheran was with them to get a glimpse of their experience. Guided by adult leaders Stephanie Gonzales, Bobby Gonzales, Gary Kreh and their pastor, Connie Miller, the youth began their Gathering journey Sunday, June 24, with a 7:45 a.m. flight to Houston. For months, under Stephanie Gonzales’ direction, the 12 teens raised funds and studied the “Gathering Getting Ready Materials.” Earlier this year they dressed in plaid shirts and funky hats while serving Texas-style barbecue to Holy Trinity members for Gathering donations. While they didn’t bring those funky hats to Houston, they did pack eight sets of matching T-shirts and 60 pounds of books for the Gathering’s “Blast off for books” drive to help economically disadvantaged students. Nearly all of these youth were attending their first Gathering, and they were visibly excited. After their flight landed, the group traveled to the University of Houston for three days at the Multicultural Youth Leadership Event (MYLE) preceding the Gathering. On the Gathering’s opening night, waves of Lutheran youth and their adult leaders streamed into NRG Stadium. The air was abuzz with anticipation; the stands were awash with a kaleidoscope of colorful T-shirts. When the overhead lights dimmed, all eyes were on stage as the band LZ7 kicked off the Mass Gathering with electronic dance music proclaiming God’s glory. Holy Trinity’s youth sat in the upper section, with a bird’s-eye view of the 31,000 attending the Gathering. Tyler Ferrer, 17, was amazed to be surrounded by thousands of Lutheran peers. ELCA Presiding Bishop Elizabeth Eaton welcomed youth to the Gathering, urging them to listen for God’s “irresistible” call and to watch for God to “show up in places we least expect.” Dynamic speakers and musicians reflected on the night’s theme, “God’s call changes everything,” inspiring youth to consider their vocations. C.J.’s favorite speaker was Bryan Stevenson, a lawyer working to revoke sentencing for juveniles imprisoned with adults. After hearing Stevenson’s story, C.J. felt motivated to speak out when he sees something unjust. Youth exited the stadium smiling, amped up by all they heard and eager for the days ahead. “I’m really excited to connect more with God and deepen my faith,” Caroline said. The youth rose early the next day to depart for the Salvation Army in Pasadena, Texas, where they would participate in service projects. One of the Gathering’s three programming tracks, Service Learning Day offers youth volunteering experience and faith-based reflection. During their orientation, they learned about accompaniment, an ELCA approach to mission defined as walking together in a solidarity that practices interdependence and mutuality. 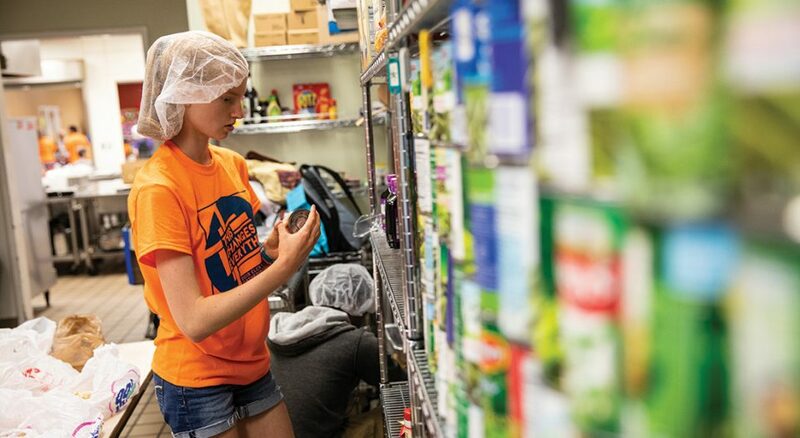 Jordan Kreh, 16, and Samantha Ferrer, 16, helped organize giant cans of green beans, boxes of pasta and other items in the Salvation Army pantry. “It was really fun because we got to work together as a team to accomplish something really good,” Samantha said. Jordan left inspired to do more service in her community—and to invite her friends to join her. 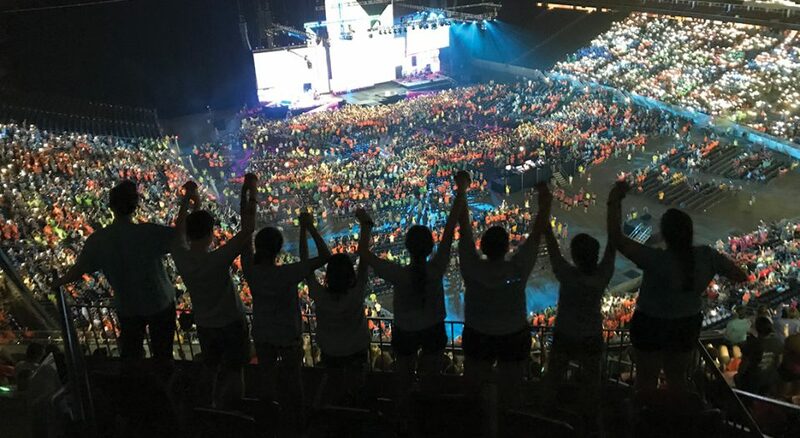 After completing their work, the youth were bused to NRG Arena for a celebration of service ceremony with 10,000 other service learning participants. Holy Trinity then spent the afternoon in the Community Life zone, racing on inflatables and scaling the rock climbing wall. At Mass Gathering, the youth heard the day’s theme, “God’s love changes everything,” reflected in story and song. The Guardian Drum and Bugle Corps ended the night with an explosive performance. This morning the youth arrived at NRG Center and found Interactive Learning Day activities underway: other groups were donating blood, working on a Habitat for Humanity build, participating in a refugee simulation and riding zip lines. Another Gathering programming track, Interactive Learning is a collection of exhibits designed to connect youth with God, their sense of purpose and God’s work in the world. It also includes play. Holy Trinity’s youth explored the ELCA colleges and universities exhibit and jumped in on volleyball and soccer games with their peers. They also wrote prayers and painted together. At the Peace Not Walls exhibit, Alicia learned how the ELCA and its global partners are building peace in the Holy Land. They delivered their $300 donation to ELCA World Hunger at the Global Farm Challenge exhibit. And later they attended practice for the mass cast, which was to perform during Friday’s Mass Gathering. Peter Olaitan, 18, found comfort in Bolz-Weber’s message. “She said that everything is going to get better after high school, whatever you’re going through—it’s fine,” he said. The youth had a little free time this morning, so they cooled off from the heat in their hotel pool. After a birthday lunch for Madison Ashley, 15, they joined others from the Delaware-Maryland Synod for Synod Day. This programming track gives youth the chance to meet and worship alongside peers from their geographic region. A time of community, Synod Day aims to foster in youth a deep sense of belonging in the wider church. Youth from the Delaware-Maryland Synod participated in icebreaker activities; sang and danced; learned about the ELCA; and heard a message from William J. Gohl Jr., their synod bishop. Gohl said there’s power in coming together as a synod and in inviting others to church. For Will, meeting their bishop was “really, really cool.” Jenna Kreh, 14, liked meeting other youth in her synod. The group was spellbound by an exhilarating concert from Tenth Avenue North. During the final slow song, they waved their smartphone flashlights in the air, a powerful visual reminder of God’s relentless hope. “No matter how dark everything gets, there’s always light,” Samantha said. After worship the 2021 Gathering site was revealed as Minneapolis—the stadium erupted in cheers. Jenna loved dancing with her youth group friends and wished some of her other friends who are struggling with depression could have heard the speakers. “It changes everything to be Christian and know Jesus,” she said. “It changes the way we think and act and our compassion toward others.” Going forward she hopes to be more welcoming and invite others to church. Miller’s highlight was watching the group, including her son Lewis, express their joy through music, dance and creative experiences. For her, the Gathering’s theme hit close to home. “We’re going through a health crisis in our family,” she said, and the week reminded her that “Jesus is always present” amid our suffering and challenges. To see Holy Trinity youth’s daily posts on the Gathering, find them on Instagram: @_htlcyouth_. 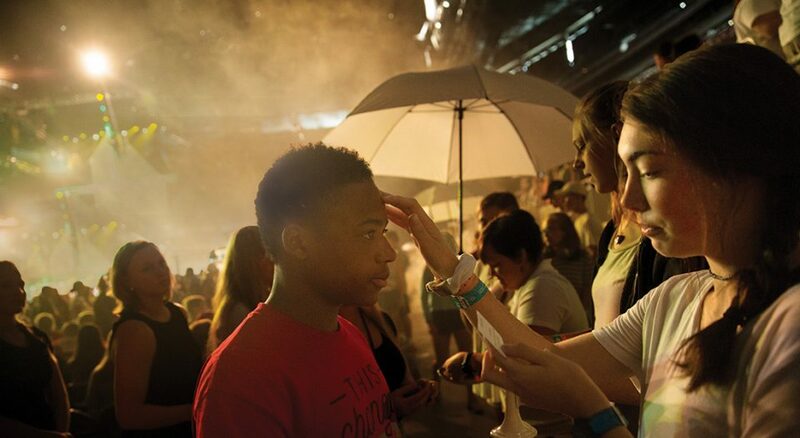 You hear the question in most every congregation: “How can we reach today’s youth?” The ELCA Youth Gathering, held every three years and just this past summer in Houston, is one answer. It brings together tens of thousands of Lutheran youth from all over North America for a time of learning, worship, fellowship, service and faith formation. Does your congregation know about this wonderful event?